Q: What can I tell people who aren't seeing their drop-down menu? For example, I have a client who can't see his on his machine, while I can on see the menu on one of my machines but not the other. Please advise what makes the difference and how to correct the problem. Q: Can your dhtml drop down menus work in conjunction with a scroll wheel? 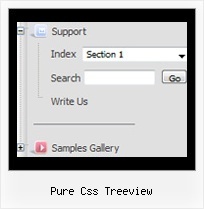 Pure Css Menu Sample Pure Css Menu Examples. Make your website navigation fast and comfortable with cascade graphics!